Rebecca Beatrice Brooks June 8, 2016 August 11, 2018 2 Comments on Why Did the French and Indian War Take Place? The French and Indian War, which took place between 1754-1763, began due to a conflict between England and France over control of the Ohio River Valley. Both sides wanted the valley so they could expand their settlements into the area. Why Did the British and French Want the Ohio River Valley? 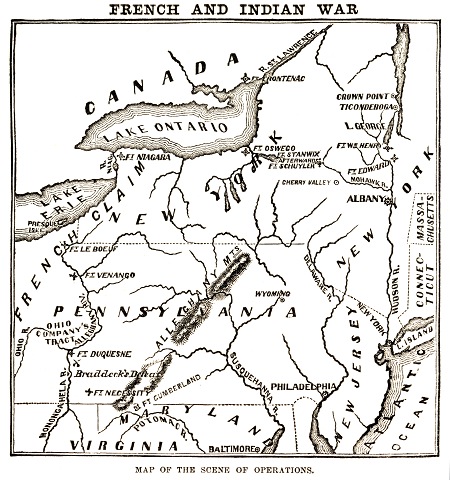 Both the British and the French claimed the Ohio River Valley as their territory. France considered it a part of New France and Britain considered it a part of Virginia. 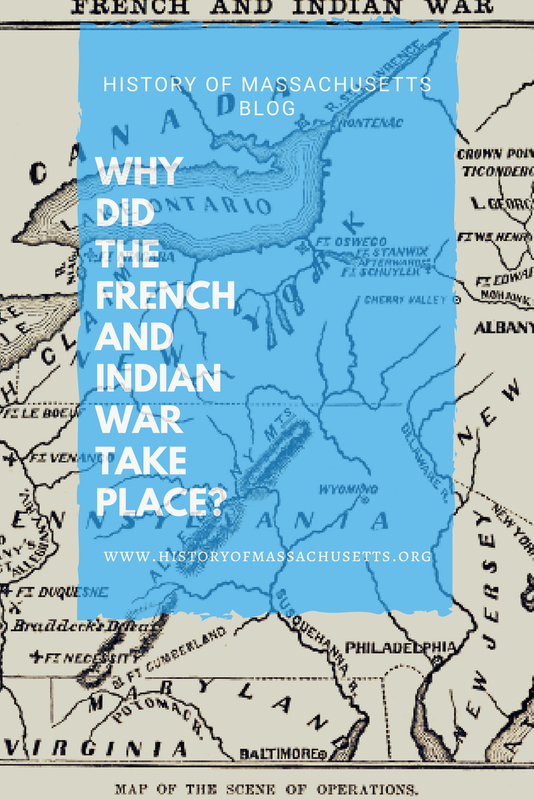 What Started the French and Indian War? A series of events happened that led to the start of the French and Indian war. The first major event was when Virginia Governor Robert Dinwiddie sent 21-year-old Major George Washington to deliver a message to Fort LeBoeuf, which was located at what is now modern day Waterford, Pennsylvania, that the fort was on British land and the French should immediately leave the Ohio River Valley. After the British failed to persuade the French to leave the area, the conflict came to a head in April of 1754 when Washington was sent with 160 soldiers from the Virginia Regiment to reinforce the British Fort Prince George near what is now modern day Pittsburgh. Before Washington reached the fort though it had already been overtaken by French forces who renamed it Fort Duquesne. Washington decided to move his troops to the nearby fortified storehouse at Red Stone Creek and wait for reinforcements before attempting to take Fort Duquesne back from the French. While marching to Red Stone Creek, Washington and his troops camped at a place called Great Meadows, at what is now Farmington, Pennsylvania, and decided to build a small way station there complete with a storehouse. On May 26, the French Captain at Fort Duquesne, Claude-Pierre Pecaudy, learned that Washington was in the area and sent Ensign Joseph Coulon de Villiers de Jumonville and 35 French soldiers to seek out Washington, inquire what he was doing there and order him to leave. The next day, the owner of a local trading post rode into Washington’s camp and informed him the French scouting party had passed his trading post the day before and were in the area. Washington was unaware of the diplomatic nature of Jumonville’s mission and he feared they were about to attack. To prevent this, on May 28, Washington and his men, with some help from their Indian allies, the Iroquois, located and ambushed Jumonville and his scouting party at their camp. On June 3, Washington and his men completed building a fort at Great Meadows to defend themselves against French soldiers enraged by the murder of Jumonville. The fort was a circular stockade with seven-foot-high walls that protected a storehouse full of supplies such as gun powder, rum and flour. During the month of June, Washington received reinforcements, boosting the number of his troops to 400, and worked on widening the road to Red Stone Creek while continuing to use Fort Necessity as his base camp. Toward the end of June, Washington learned a large force of French and Indian soldiers from Fort Duquesne were heading their way. Since there wasn’t enough time to reach Red Stone Creek, on July 1, Washington decided to turn back and make a stand at Fort Necessity. On the morning of July 3, 600 French soldiers and 100 Indians approached and began attacking the fort. 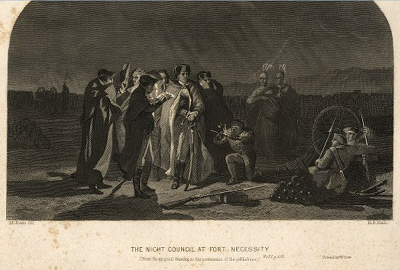 Fort Necessity took heavy casualties and Washington lost about one third of his men. The fighting continued until about 8pm when the French commander, Captain Louis Coulon de Villiers, brother of Jumonville, requested a truce to discuss Washington’s possible surrender. Washington sent two of his men, Jacob Van Braam and William Peyronie, to meet with Villiers. After negotiating for several hours, Van Braam was handed a document outlining the terms of surrender, which he delivered to Washington. Washington agreed to the terms and signed it, not knowing that the document, which was written in French and translated to Washington by Van Braam, stated twice that the British had “assassinated” Jumonville who was on a diplomatic mission to deliver a message. Washington later denied this assassination charge and explained that Van Braam told him the document only said the British were responsible for the death of Jumonville. Since the murder of a diplomatic envoy was illegal under 18th century law, Washington’s signature on a document charging him with the crime did not cast him in a favorable light among the French. When the Battle of Fort Necessity was officially over, the British were allowed to withdraw their troops, retain their weapons (except for their swivel cannons.) The British left the fort for Willis Creek on July 4. The French burned Fort Necessity and returned to Fort Duquesne, thus bringing the first battles of the French and Indian War to a close. The following year, the fighting moved to Fort Beausejour, before spreading to other areas in North America, such as New York, Virginia and parts of Canada, and eventually spread to Europe in 1756 where it became the Seven Years’ War. Some notable people who later fought in the French and Indian War include Paul Revere and Daniel Boone. The events of the war, as well as the debt that the British government incurred during the war, later paved the way for the American Revolution. Middlekauf, Robert. Washington’s Revolution: The Making of America’s First Leader. Vintage Books, 2015. Dixon, David. Bushy Run Battlefield: Pennsylvania Trail of History Guide. Stackpole Books, 2003. I love History and I know a lot about Washington. This was one thing I didn’t know and took me by a shock.